BO'LOC IS FROM ONE OF THE GREATEST BREEDERS OF OUR TIME. THE PATRICK DOGS IN GENERAL HAVE MADE AN INCREDIBLE IMPACT WORLDWIDE. THERE CONTRIBUTION TO OTHER BLOODLINES HAS PROVEN TO PRODUCE SOME OF THE BEST BULLDOGS ON THE PLANET! 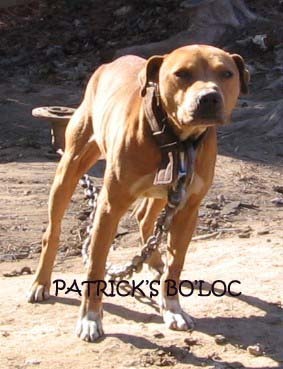 INDIAN BOLIO, TOMBSTONE/MALONEY, AND CLOUSE BLOODLINES WERE THE CATALYST OF PATRICKS BREEDING PROGRAM.